I'm running Windows 10 (64 bit) -1803 version on my Lenovo G500 laptop. It has AMD Radeon HD 8570 (2GB) graphics card, Intel integrated HD graphics 4000, i5 processor, 500 GB SATA Hard disk and 8GB DDR3 RAM. I don't play games on my laptop at all and do mostly graphics work that involve software like Adobe InDesign, Illustrator, PHotoshop, AutoCAD and SketchUp. Earlier, I was running into freeze while installation of Adrenalin Edition 18.4.1 drivers. So I did a clean install of Windows and let the windows update install all the requisite drivers. It installed drivers for both AMD and Intel integrated graphics. My windows are up to date. In order to further check for update my intel and AMD drivers, I updated these drivers through device manager of windows. 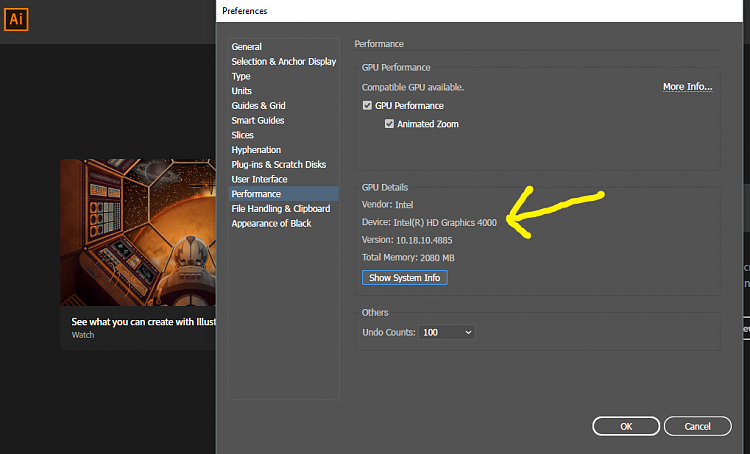 Now, in order to force enable AMD graphics driver usage, I right clicked on my desktop wallpaper and clicked AMD radeon settings. I received the message that no AMD graphics drivers are installed. Therefore, I used DDU in safe mode to uninstall AMD drivers. Then I rebooted windows in normal mode and installed Adrenalin Edition 18.2.1 . My laptop froze while installation of these drivers. I booted my laptop in safe mode, and did a system restore. Now I’m back to the situation where I’m getting the message “no AMD graphics drivers are installed”. Should I completely remove intel and AMD drivers, and install Adrenalin Edition 18.2.1? That’s because I don’t want intel graphics drivers at all and want only AMD graphics for all the GPU purposes. Moreover, should I boot into safe mode and install these drivers or these drivers should only be installed in normally booted windows only? Is this the driver that you downloaded and installed on your Laptop? Mobile . Go to your laptop's Support site and see if they have an Updated BIOS and CHIPSET for your Laptop and Intel CPU. If they do, update those first. New BIOS and CHIPSET makes software and hardware more compatible. Then follow the instructions on how to update your laptop from AMD Forum: Laptop graphics update...How to then to make it switchable graphics follow this from AMD Forum: Configuring Laptop Switchable Graphics on a Windows® Based System . Thanks for the reply. Yes I tried the same drivers as mentioned on the link that you've shared. I have tried installing version 18.4.1 and 18.2.1. Please provide me the version number and the link of the driver that you are advising me to download and install. If I completely uninstall AMD drivers, I'll be automatically still using Intel drivers for integrated drivers for on board graphics. MS Basic Display Adapter drivers will only be active if I uninstall both Intel integrated HD graphics and amd display drivers. The above basic steps is if you only have a Discrete Graphics card. But you are correct, it would show the Integrated Graphics after the discrete Graphics has been uninstalled. Be sure the Intel Graphics driver and the Intel Chipset is up to date for your Laptop. Make sure you have the latest BIOS installed for your Laptop. Be sure your Windows is totally updated via Windows Update. It is best to use your Laptop's manufacturer's AMD Drivers first before using AMD Generic Laptop drivers. Install those first and see if your laptop works correctly. If it does, then try to Re-install the AMD Generic updated drivers and see what happens. Read the link about how to configure your Switchable Laptop Graphics. I don't believe you can dedicate just the laptop's discrete Graphics to work all the time. The Laptop utilizes both Integrated and Discrete depending on the Graphics load that it requires. I don't know if you can disable the Integrated GPU under BIOS or not in a laptop. I know with a Desktop you can disable under BIOS the Integrated Graphics and just use the Discrete GPU Card. The link is the latest Laptop driver for your HD 85xx series Laptop GPU. You might want to try previous drivers and see if it works better like the ones from Lenovo. I found a Lenovo G500 at Lenovo Support : laptops and netbooks :: lenovo g series laptops :: lenovo g500 notebook Lenovo PC Support . You need to find the exact Laptop model for the G500. The one I saw in the link doesn't seem to support Windows 10. Maybe the type of G500 model you have Does support Windows 10 and has Windows 10 drivers at Lenovo Support. If this is the correct Laptop than I suggest you Contact Lenovo Support and find out if your Laptop is capable of upgrading to Windows 10 from Windows 8.1. That can be one reason why you are having problems if the laptop is not technically advanced enough to upgrade to Windows 10. If it does, then try to Re-install the AMD Generic updated drivers and see what happens. Please provide me the exact version number of the driver that you are recommending me to install. There are 3 drivers available to install on this link. 1) Adrenalin Edition 18.4.1 Optional - 4/30/2018 - I have laptop faced freeze while installation of this one. 2) Adrenalin Edition 18.2.1 -2/7/2018 - I have faced laptop freeze while installation of this one. 3) AMD Minimal Setup 39 MB - 4/30/2018 - I haven't tried this one at all. I don't believe you can dedicate just the laptop's discrete Graphics to work all the time. The Laptop utilizes both Integrated and Discrete depending on the Graphics load that it requires. I don't know if you can disable the Integrated GPU under BIOS or not in a laptop. I know with a Desktop you can disable under BIOS the Integrated Graphics and just use the Discrete GPU Card. Yeah, Lenovo doesn't provide drivers for Windows 10 neither they recommend to install it on G500 machines. However, some of my friends and colleagues have installed Windows 10 on laptops and machines containing all hardware manufactured in or prior to 2011. They are also using it without any glitch.Therefore I feel that there must be some way to successfully run Windows 10 on my laptop. I believe that the 2GB AMD graphics card is more superior to integrated intel graphics. For using graphic intensive applications like Photoshop, Illustrator, AutoCAD and SketchUp, AMD graphics would a better choice instead of Intel. Thanks a lot for giving tips. Uninstall the current AMD Driver and use the Minimum Setup. This will install just the drivers needed. It probably might not install Radeon Settings. Am not sure though. Try it and see if it installs. It you continue to have problems it could just be your laptop is not compatible with the current AMD drivers. Yes you are probably correct. Are you able to switch graphic on your laptop to tell it to use those programs rather than the Integrated? The link on "how to configure your laptop" should explain how to do that. If updating to the latest BIOS doesn't improve your situation and Lenovo doesn't recommend installing Windows 10, then you must resign yourself to the fact your laptop is not totally compatible with Windows 10 and some of its latest drivers. Sorry, I can't really suggest anything more. Try to install a previous AMD driver that did work and work with that. Normally when the Laptop Manufacturer doesn't list drivers for an OS is because they believe that OS is not suitable to run on the laptop. Maybe someone else here in the Forum who has a old laptop like yours might be able to suggest something. Thanks for a detailed reply. Had been busy all this while and couldn't get back on this issue. I updated my BIOS from the link you provided. Yesterday I installed Radeon driver 18.5.2 minimal edition using first express install settings. Before its installation I checked for windows update first and found that my windows were already up to date. My intel onboard graphicsThe installation of AMD driver froze as the white rectangle filled 3/4th of the portion. I waited for 30 minutes and forced shut down down my laptop. I started in safe mode and ran latest version of DDU (display driver uninstaller) and then started my laptop in normal mode and ran the 18.5.2 installation, with custom installation>AMD display driver checked only. My laptop froze again. Then I again started my laptop in safe mode, ran DDU, clean uninstalled AMD driver.Then I tried the following drivers downloaded from official AMD website one after the another. Adrenalin-Edition-17.12.2-Dec19.exe - faced same freeze issue. Rebooted, ran DDU to cleanly uninstall it. Then I installed radeon-crimson-15.12-win10-64bit.exe. I unchecked Vulkan and installed all of other components. It installed fine. However, unfortunately, after I started illustrator CC 2018 and checked whether it was detecting my AMD graphics card, it showed intel hd graphics instead (see screenshot attached). 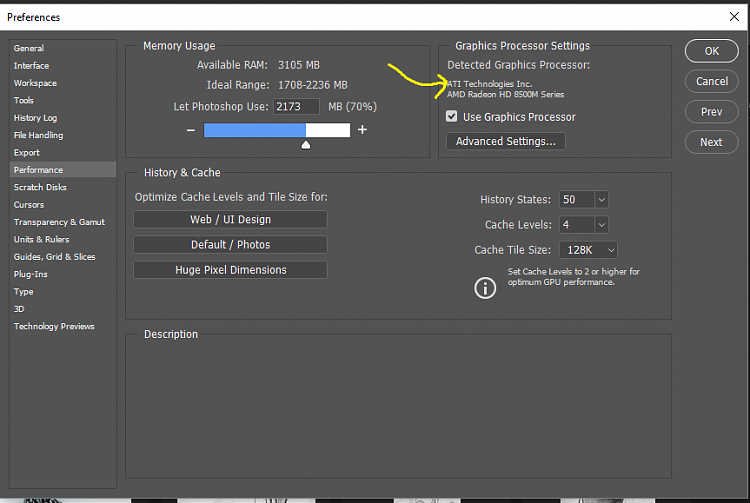 Interestingly, Adobe Photoshop CC 2018 detects AMD graphics card (see screenshots attached). My laptop suddenly changed its brightness all of a sudden while I was taking screenshots, and then I got the message that windows hardware settings had changed and I should reboot. I rebooted. Upon checking in the AMD settings I noticed that now I was running 17.1.1 version of the driver (see screenshot attached). I started Illustrator to check but it was still showing intel graphics instead of AMD ones. What should I do now so that Adobe Illustrator uses AMD graphics instead of intel onboard ones? Sorry to hear that. But it just seems like you laptop is not totally compatible with Windows 10 which may be the problem. If Lenovo even said it was not compatible I would take their word for it since they are aware of Windows 10 minimum requirements, hardware wise to run. I don't know what to tell you how to get your old Laptop to run with the discrete AMD gpu and not Intel's integrated Graphics. Hopefully someone else might be able to step in offer advise.